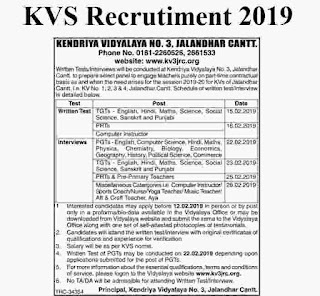 KVS Recruitment department is looking to fill up the various vacancies of teaching and non-teaching posts in the various schools all over India. 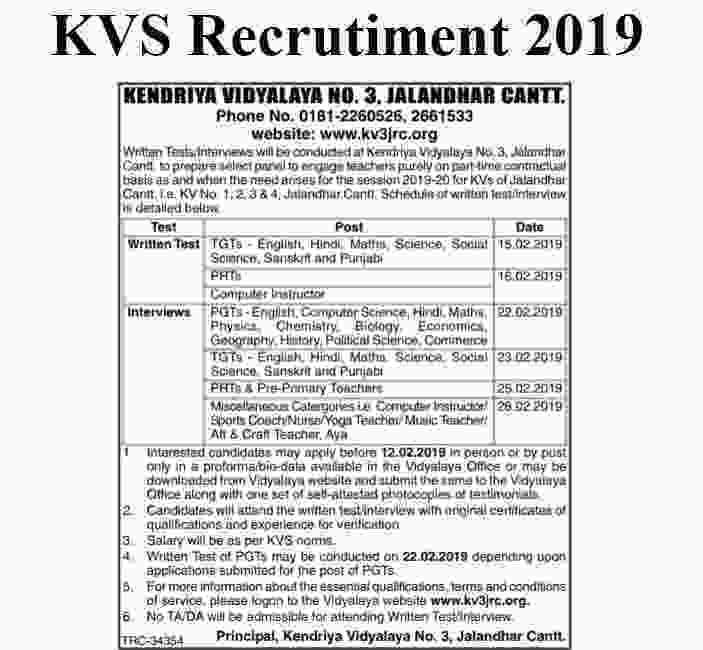 A fresh KVS Recruitment notification is out from Kendriya Vidyalaya Jalandhar that they want to recruit fresher candidates for various job profiles. Written Tests / Interviews will be conducted at Kendriya Vidyalaya No. 3, Jalandhar Cantt to prepare select panel to engage teachers purely on part time contractual basis as and when the need arises for the session 2019-20 for KVs of Jalandhar Cantt. i.e. KV No. 1, 2, 3 & 4 Jalandhar Cantt. Schedule of written test/interview is detailed below. Written Exam for: TGTs – (English, Hindi, Maths, Science, Social Science, Sanskrit and Punjabi) will be done on 15.02.2019. Written Examination for PRTs, Computer Instructor will be done on 16th Feb. 2019. Direct Walk-in-Interviews PGTs – (English, Computer Science, Hindi, Maths, Physics, Chemistry, Biology, Economics, Geography, History, Political Science, Commerce)will be done on 22.02.2019. After Clearing the Written Exam TGTs – (English, Hindi, Maths, Science, Social Science, Sanskrit and Punjabi) will go through the Walk-In-Interview round which will be done on 23.02.2019. Similarly Walk-In-interview for PRTs & Pre-Primary Teachers will be Done on 25.02.2019. 1. Interested candidates may apply before 12.02.2019 in person or by post only in a proforma/bio-data available in the vidyalaya office or may be downloaded from vidyalaya website and submit the same to the vidyalaya office alongwith one set of self sttested photocopies of testimonials. 2. Candidates will attend the written test/interview with original certificates of qualifications and experience for verification. 3. Salary will be as per KVS norms. 4. Written Test of PGTs may be conducted on 22.02.2019 depending upon applications submitted for the post of PGTs. 5. For more information about the essential qualifications, terms and conditions of service, please log on to the vidyalaya website www.kv3jrc.org. 6. No TA/DA will be allowable for appearing in Written Test / Interview.